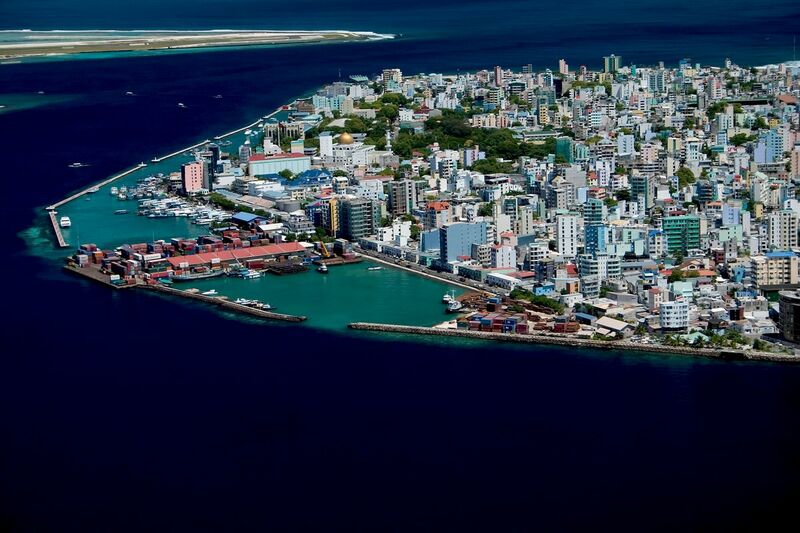 Malé, which is less than 2 km long, located at the southern rim of North Male Atoll. Male is sometimes overlooked by travelers as simply a transit destination to places like Ari Atoll, with nothing to do, and it is indeed not a party place, mostly due to its alcohol-free policy. However, it does have a distinctive character of its own, with narrow streets, colorful houses, graffiti and a strong communal feel. If you're got the time, stop a little longer and soak up the atmosphere. The neighboring islands Hulhumale (artificial) and Vilingili are served by frequent and very cheap public ferries, and provide much a gentler alternative to the capital city. For nearby resort accommodation, nothing beats the Conrad Maldives Rangali Island. few times a year, which is nothing a refreshing dip in the ocean can’t fix. December through April marks both the high season and the dry season on these tropical islands, and although you may be paying more for your resort, it’s worth avoiding the monsoon season that stretches the rest of year and can put a damper on your sunbathing time. Scuba divers have a little more luck, as the Maldives are great for diving all year, with visibility better in the west from May to November, and in the east from December through April. You have arrived at the main gateway to catch your island-hopping mode of transportation to paradise. For an archipelago wrapped in ethereal blue and green ocean with perfect mounds of sand, the arrival point of Male is a bustling city of locals comprised of students, island resort laborers and surprising traffic. It balances out the other-worldly feel you get as soon as you disembark onto one of the many idyllic spots of paradise. Over-the-water bungalows, umbrella cocktails, crystal clear seas and all-in-all bliss await. *Budget tip: Stay at a locally-owned guesthouse versus island resort. Experience local culture plus pristine paradise. Island-hopping is key and variety is the spice of life. Happy traveling! Its the gateway to 1000 islands of Maldives, Visit Male and ask anyone for the transport to any island among the thousand Islands of Maldives. The airport is pretty primitive. Once you get out the gates there are a bunch of stalls that go to the different hotels. Where we we're staying we had to take a speed boat for an hour to get to. The ride was slightly rough but once we got to our destination, breathtaking. Kind of gritty place but really bustling and lots of character. Watch out for the traffic.